The new M1 drivers from TaylorMade is great for players that like to play a strong fade. I lost distance and accuracy when drawing this driver. The club face sits (or appears to sit) slightly open at address. I got good distance with a high fade when hitting this driver. The M1 looks and feels different than the previous R15 Driver. 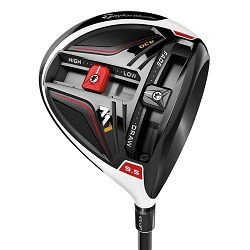 I dont think it’s any longer than the R15 or most recent TaylorMade drivers, but I do believe you gain some control with it over the predecessors. The crown is made of a new ultra-light carbon multi-material construction for improved feel. Obviously, as with previous Taylor Made drivers, there is plenty of adjustment options for loft angle, and closed to open face to produce higher or lower ball flight while hopefully decreasing spin. The sound on impact is much softer and solid than the “tink” of yesteryear. The tight dispersion pattern you will have is great and shows the excellent level of control you can have with this driver.